A Boy Named Charlie Brown. Lee Mendelson Film Productions/Bill Melendez Productions 1969. I’m a bit unsure about how Peanuts will work as a movie. I know for a fact that there will be sketches gleaned from strips before the plot gets going, but I don’t know if there’s going to be a “movie” enough story when it does. I don’t even know what the plot is, but I have the impression it involves a season of baseball. It’s unusual for me that this is a well-known franchise, but I don’t particularly expect great performers or direction. Aside from Charles Schultz, the best-known artist associated with Peanuts is Vince Guaraldi, and I’m not even sure if his trio is doing the music for this. It’s the start of baseball season, and Charlie Brown takes losing the first game of the season (99th straight loss for the team) harder than usual. Lucy and several other children are also being hard on him for being a born loser. In a serious funk, he takes Linus’s suggestion to try entering the spelling bee to prove to himself and everyone else that he can win at something. He wins out of his class, he wins out of the whole school, and just when he thinks he’s proven himself and won’t need to do it anymore, he finds out that he has to advance to the National Spelling Bee in New York and compete on television. With the weight of the whole school’s reputation on his back, and an admonition from the crowd of kids to “come back victorious or don’t come back at all!”, what can he do but study every waking moment and then some? I was very impressed by the depth of this movie. I’d been worried that the Peanuts formula wouldn’t fit the 90-minute format, but it excels at it. Of course, one-off sketches are interspersed throughout, but where the theatrical film mode really excels is in having the space to really explore Charlie Brown’s depression. I never expect much out of the child actors voicing the characters, but some combination of the performance and the writing got me seriously thinking that he needed real professional help. Shortly thereafter, he of course sought it, from the same fake professional he always goes to. And Lucy’s therapy is particularly damaging. But throughout, it never felt like a Lesson About Depression, which it would have been if it had been done as a TV special. That would have hit it harder and more superficially, but I really got a sense that he was hurting. In “A Charlie Brown Christmas”, Peter Robbins (Charlie Brown) sometimes came off as if he didn’t even understand what he was saying, but in this, his last performance in the role, I think he really does deserve credit for making it real. I was also curious about the art style. There’s not much latitude for changing the look of the characters, but I wanted to know if there was any way that feature film money would be evident on the screen. Right in the opening shot, I could see the subtle change. The backgrounds were much more artfully detailed than on TV. They were looking at clouds, and the shot actually shows puffy clouds drifting by. Shortly thereafter, the film introduces another way the art budget is made apparent: the national anthem flag sequence shows there will be musical numbers with intricate, artistic visuals. I enjoyed most of the songs, but I didn’t care for the title song. 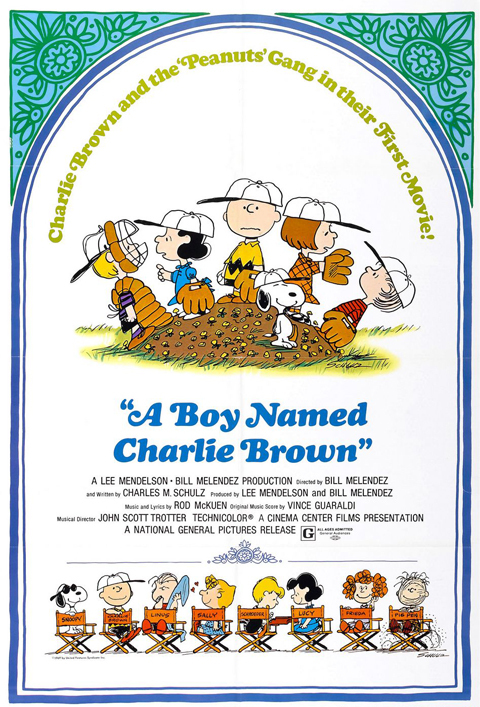 Aside from the music not seeming to fit very well with anything, I thought the lyrics lacked subtlety, as they specifically say “Charlie Brown is every kid, in every town.” That’s not a thing that needed spelling out. Also, while otherwise a decent song, “Failure Face” is an awkward jeer to come up with. “I before E” is a lovely song that I’d advocate being taught in schools if the titular rhyme (all the way through “neighbor and weigh”) didn’t have more exceptions than examples. Vince Guaraldi’s jazzy score also seems a bit bigger yet subtler than usual. While at times this dragged, the mixture of depth, levity, and art made this film a winner. I was surprised to learn there was even one Peanuts movie, and now that I’ve seen this, I’ve learned there are three more. After this gem, I will definitely follow up with them at some point. Watch this movie: for a message about depression that knows it needs less “and this is really about you!” and more jokes about dogs thinking they’re pilots. Don’t watch this movie: if you think the funny pages should be funny all the time.